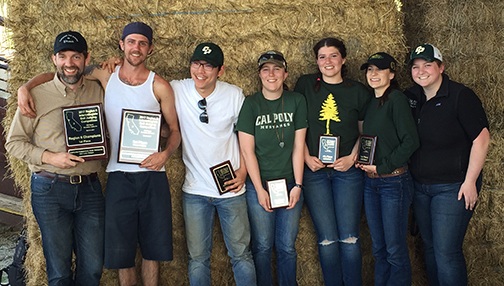 The Cal Poly Soil Judging Team won first place in the Region 6 Collegiate Soil Judging Competition held March 4 in Woodlake, California. The competition, sponsored by the American Society of Agronomy and the Soil Science Society of America, challenges students to describe, classify and interpret soils in the field in a competitive setting using standards established by the USDA Natural Resources Conservation Service. The win advances the Cal Poly students to compete as one of 24 qualifying teams at the National Soil Judging Competition hosted at Northern Illinois University from April 23-29. Natural Resources Management and Environmental Sciences Professor Gordon Rees coaches the team with assistant coach Kelly Carter. The Cal Poly team, comprised of five students, took first place in group judging and first place overall. Awards were also given to the top six individuals at the competition, with four of the five team members placing in the top six. Environmental soil science senior Adriana Delucchi of Stockton won first place overall in the individual competition. Environmental soil science senior Riley Haas of Morro Bay placed fourth, environmental earth science senior Taylor Cullum of San Luis Obispo placed fifth, and soil science senior Angus Chang of Davis placed sixth. Twenty-five students from three universities participated in the regional competition. The National Soil Judging Contest has been held at a different host institutions each year since 1961. Soil contestants arrive at various soil pits and are expected to correctly identify, evaluate, classify and describe four soil profiles. Region 6 includes California, Alaska, Arizona, Hawaii, Nevada and New Mexico. Photo information: The Cal Poly Soil Judging Team and its coaches are pictured from left to right: Coach Gordon Rees, students James Smith, Angus Chang, Taylor Cullum, Riley Haas and Adriana Delucchi; and assistant coach Kelly Carter.